Three years ago it was not thought that Tirana could have this climate of solidarity with people in need. Today, thanks to the social policies of the Municipality of Tirana, everyone in the capital, despite economic opportunities, has a safe and secure meal. After the reconstruction of the 3 existing social refectory centers and the opening of other 3 new refectories, Tirana has another new social center in the Unit 7. 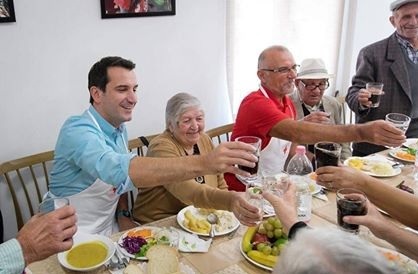 The opening ceremony was attended by the mayor of Tirana, Erion Veliaj and the head of the Albanian Red Cross, Ylli Alushi, who together served lunch for the elderly and persons in economic difficulties in this area. Thanks to the Red Cross for co-operation, Mayor Veliaj stressed that this refectories will be another success story, which comes to the aid of people in need of Unit 7. "It is a wonderful tradition and proves what we have long said: no one has the monopoly of the help, solidarity; the State must do its own, the Municipality as well, but when everyone gets a part of the burden, everything becomes easier. That is why I am blessed today, happy and very pleased that we are sharing this burden of help with our communities along with the friends of the Red Cross. I am glad that you have chosen this community in need, but there is nobility and dignity, and in the hands of colleagues and the entire network of volunteers I am sure it will be a success story," Veliaj said. According to the mayor of Tirana, today the city has a whole network of community centers and social centers that are ready to cope with any emergency and need by people in need. Albanian Red Cross Chairman Ylli Alushi expressed his gratitude for the assistance given by the Municipality of Tirana, while stressed that the project of this social center will be long-lasting. "The Albanian Red Cross decided to open this activity, always in support of its mission, to help the most needy people. It is an Albanian Red Cross mission to help people in need, to go back to our origins, to offer a soup, a warm meal. Our wish is for this project to extend as much as possible and extend to other districts, even in other environments," Alushi said. In Tirana, there are currently 7 social refectories that offer a warm meal for people with economic disabilities, while about 800 in one day can receive service out of 150 people a day in 2015.